When you walk through your facility, do you have more questions than answers? Do you get frustrated with the lack of organization and attention to detail in your facility’s procedures? Do you wish there was a way you could standardize work in a way that kept your facility working as efficiently as possible, at all times? If these are the type of questions that keep you up at night, then it might be time for you to look into the systematic Lean process known as 5S. The deceptively simple approach is turning facilities into more efficient and organized workplaces, all over the globe. Regardless of what type of facility you operate in, it can make a positive impact — immediately. Sort: (Seiri) Eliminate all the things in the workplace that are not being used and store them away. Set in Order: (Seito) Arrange the items used on a daily basis so that they can be easily accessed and quickly stored. Shine: (Seiso) Ensure everything is cleaned and functioning properly. Standardize: (Seiketsu) Develop a routine for sorting , setting, and shinning. Sustain: (Shitsuke) Create a culture that follows these steps on a daily basis. The 5S approach is one that can completely change your organization, if it’s backed by a culture that believes in it’s effectiveness. It’s a process that will not show its true value unless each step is completed and continued. The 5S process never stops. It’s an ongoing routine that is practiced every day with total concentration and dedication to help sustain and uphold the culture transformation you’re looking for. Improved efficiency- 5S is a way for the entire organization to improve. It will keep your staff focused on eliminating any possible disorder by removing all forms of waste. Fewer delays- When everything is where it is supposed to be and placed in a manner that is as close to where it’s needed as possible, you spend less time looking for those items and more time actually working. Production time is reduced- A thoughtfully designed 5S facility will ensure that your workers are working smarter and ergonomically correct, which results in less production time in the end. Employee morale is increased- 5S is a company wide process that will only succeed if everyone feels involved in it. Allowing your employees to be involved in the process of organizing their workstations to better fit their needs, will get you the feedback needed for improvement and increase their morale along the way. Higher quality- Standardizing work flow will undoubtedly improve your quality, resulting in a better product for your customer and higher profits for you. How can floor tape help? To help sustain your 5S implementation, many organizations are turning to a color-coded 5S floor marking system to help their cause. Visuals are a vital part of any workplace, but especially in one that emphasizes 5S as a pillar of their operations. 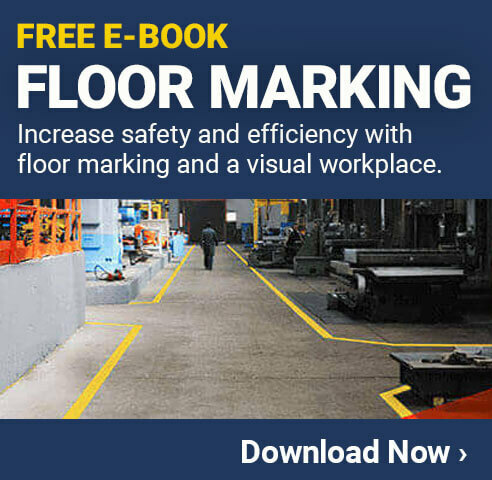 To help set the foundation for your ‘set in order’ step in the 5S process, you can use floor tape to correctly mark and organize your facility’s floors. This helps create order and flow in your facility that is unquestionable and easy to follow, allowing the rest of your 5S implementation to follow suit. When you eliminate confusion, you eliminate waste, which is what your organization should be aiming to do, at all times. There are many types of floor tape out there to choose from in a variety of colors. You should always be careful when selecting your color scheme and keep it as simple as possible, as not to confuse employees or visitors. Black and white: Areas to be kept clear for operational purposes. Some organizations will choose to use their own color scheme, rather than adhere to the recommendations. This is not necessarily a bad thing, as long as it is clear and everyone understands what the colors mean in each application. A major part of your 5S implementation is creating a visual workplace where what should happen, happens, because of visual aids. So as long as you have clearly defined what your floor marking colors mean and everyone understands their purpose, your visual workplace will be effective. Mark off all tool and equipment locations. Create visual cues to alert those in view of different work areas – ie: finished goods, works in progress, scrap, etc. Mark off dedicated areas like recycle, trash, and red tag locations. Directional arrows and/or guides, which help employees and visitors quickly navigate your facility. Your questions have answers, but it takes action on your part to put those solutions in motion. Creating a culture that lives and breathes 5S is not easy. The culture that you create is a direct reflection on you and the effort you put towards it, but this is the action needed if you want to have long-term success with 5S. Combining a well structured floor marking system, using high quality floor tape is a great start towards your 5S implementation and easy way to show your dedication to the process.